Was Ken Howell an ace? When it comes to starting pitchers in Major League Baseball, the term “ace” can often be used very loosely. We think of a true ace as a horse, a pitcher whose mere presence almost guarantees his team a win every fifth day. On the flip side, an ace can also just happen to be the best pitcher on a very weak staff. For the majority of the 1989 and 1990 seasons, Ken Howell fell into this category for the Philadelphia Phillies. So was Ken Howell really an ace? No, not by a longshot. But for a time, he was the best the Phillies had to offer. Which probably tells you all you need to know about life for the Philadelphia Phillies in the late 80s/early 90s. His 12 wins were tied with reliever Jeff Parrett (98 K’s in 105.2 IP, helping make him trade bait for Dale Murphy and Tommy Greene the following season); Ruffin and Cook were tied for second among starters with 6. More meaningfully, his 204 innings were by far the most on the staff (Carman was second with 149.1, despite the 68 ERA+), his 7.2 K/9 was best among starters, and his 3.44 ERA was .55 better than Cook, the only other starter below 4. How did Howell rank among the rest of the NL? He was 3rd behind Jose DeLeon and Sid Fernandez in fewest hits/9 at 6.838 and 7th in K/9 behind Mark Langston, Fernandez, Tim Belcher, David Cone, DeLeon, and John Smoltz, all of whom were aces by any definition in 1989 (even Belcher, arguably the least remembered ace among them, had 8 shutouts that season). His 164 total K were 10th in the NL behind the same aces plus Mike Scott and Bruce Hurst. He was 4th in fewest HR/9 at .485, behind Joe Magrane, Orel Hershiser, and Ken Hill. On the other hand, his 86 total walks were tied with teammate Carman for 5th, behind future ace Hill, former aces Fernando Valenzuela and Kevin Gross, and Langston, and he led the NL with 21 wild pitches, five ahead of runnerup John Wetteland (who had 16 in only 102.2 IP but would only have 24 more the rest of his career). Threw 21 wild pitches last year, most in the major leagues. Despite that, I think that having finally gotten his career on track, he is a good bet to stay on track, and could get better. He had more strikeouts last season than hits allowed, and there aren’t very many starting pitchers who can say that…Even if he pitches well, the Phillies may stick him with a losing record. 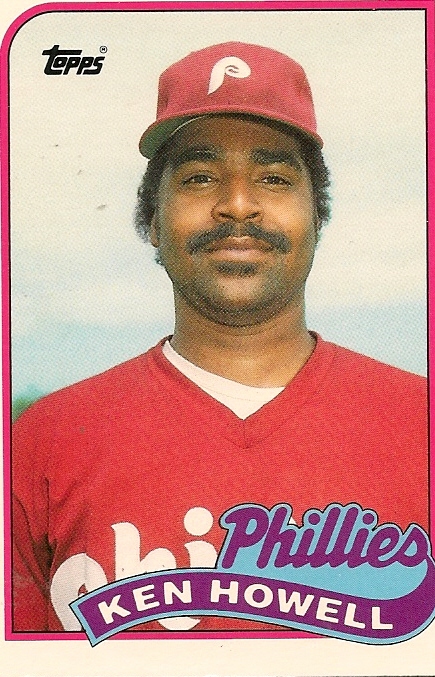 The 1990 Ken Howell wasn’t quite as lucky: his BABIP rose to .288 (the only Phils starters with a higher BABIP were Pat Combs and Ruffin, who continued to be bombed to the tune of .324), his opponents’ slash stats to .260/.343/.422, and the only traditional category where he ranked within the top 10 was wild pitches (tied for 10th with 8). But he was injured, and after a 4 inning, 5 run appearance versus the Pirates on August 5, 1990, Howell would never throw another pitch in the majors. Can he come back from the injury? Howell was pitching great, the best ball of his career, through June 17 last year (8-3, 2.48 ERA), when he had a series of poor starts which led to the disabled list, eventually to arthroscopic surgery on the shoulder. I think chances are good that he will come back and have his best year in 1991. Sadly, he wouldn’t. But if Howell was never a true ace, he came a lot closer than a longshot. This entry was posted on August 12, 2010 at 4:18 pm and is filed under the de Jesus Era. You can follow any responses to this entry through the RSS 2.0 feed. You can leave a response, or trackback from your own site.